I keep thinking I’m lazy and far behind. That’s seven shows out of a week, I guess I’m doing that bad. It’d really be a list if I threw in The Crash, but I’m not sure I’m doing another year of full recap off handheld videos. I somehow gave the Drone match an OK? That seems like a bad job out of me, hurrying thru watching a match I slept thru. 6) Liderk, Spartan, Spector b Capo Del Norte, Capo Del Sur, Máscara Año 2000 Jr. It sounds like it’ll be a singles match between one Trauma and one Pantera. And then maybe they’ll drop this feuding referee thing. Today’s Puebla show has one more rematch of 2017’s incredible pairs final before they can finish the 2018 version of that tournament. Volador & Cavernario take on Ultimo Guerrero & Valiente in a rematch of one of the best CMLL matches of the last year. It probably won’t be quite as good this time, but it should be along the same lines of quality as their rematch last month at the Best of 2017 Arena Mexico show. Soberano takes on Mephsito in a lightning (ten minute time limit) match, following up on the two feuding in singles matches the last couple of weeks. Soberano won the only other singles match between the last October, though he left the match shaken up. This match seems like it should set up a title match between two next week; both are welterweight champions. The fourth match is an odd NGD vs Johnny Idol, Okumura and Kraneo trios match. (Sam Adonis might still be on vacation.) Kawato, Malayo and Universo 2000 Jr. face Lestat, Pegasso and Stigma in the third. Astro & Flyer are among those in opening matches. The show will air at 9pm on CMLL’s YouTube channel as normal. Last night’s Zorro & Kevin Kross versus Rush & Cibernetico match ended with Rush betraying Ciberentico after Ciberentico had him with a kendo stick by accident. 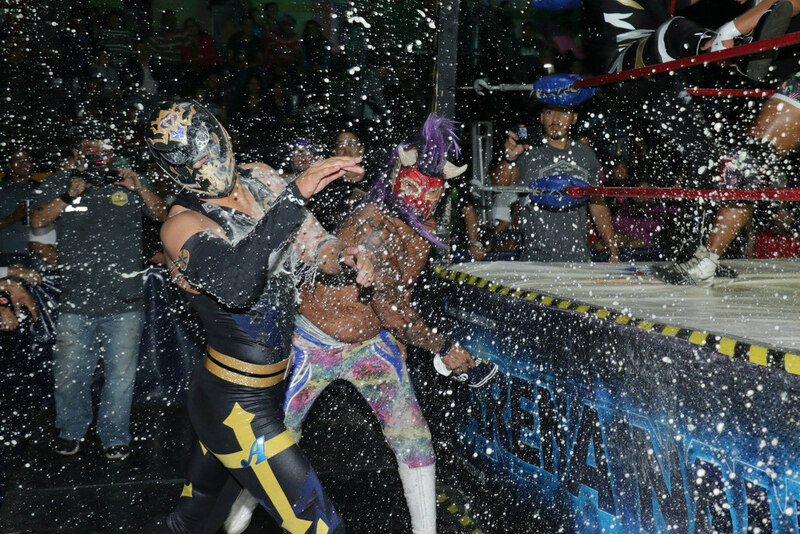 After they argued and Rush left, La Mascara made a surprise appearance to set up a match for the next show. It sounds like they were careful not to let Mascara & Rush to be in the ring at the same time to avoid getting in trouble with CMLL. On AAA TV, La Mascara & Maximo had declared they were 100% AAA. Like everyone else with a name who’s come in recently, they still seem to have the freedom to work elsewhere on their own time. A main event with Alberto el Patron, Rey Wagner & Rey Escorpion drew 1,800 in Torreon on Saturday, a full house. Wagner beat Escorpion while Alberto cut off Wagner’s son from inteferring with an armbar. In Arena Jalisco on Sunday, Maravilla Azteca unmasked Sunny, who was revealed to be Eduardo Ayala Perez, 28, 11 years a wrestler. Rayman won the vacant Jalisco heavyweight championship on the undercard. Legends of Lucha Libre action figures are coming soon. Segunda Caida reviews Demus vs Wotan. A Wednesday show! With lots of very young people and nothing much going on. Chef Benito is probably supposed to be Chief Benito but I could go for a Chef luchador. Tiger & Puma are the only team of this bunch who’ve challenged for the tag titles. Esfinge & Triton have matching gear, so they’re a favorite. This was the b-show version of Último Guerrero & Volador, which is actually a pretty pleasant occurrence. Both men’s issues revolve partially around a seeming need to do every single move they can do in every single match, and a stripped down version is preferable holds surprises for what they choose to leave out. And they do add a few things to the parade of two counts; can’t recall seeing Último Guerrero pull out a German suplex much. It’s still some checklist stuff – UG goes front superplex, super bomb, suplex into the ring. Finish would’ve come off better if Último Guerrero didn’t already use up that superbomb, but it does still look spectacular and the crowd reacts well. Strong fans of these two guys would like the match even more. It’s really too bad this was much a Mariachi Locos year – they didn’t team much even while champions and haven’t afterwards – because they’re a really fun time when they’re working hard. They just run over the técnicos impressively in the second and third fall before the comeback. The técnicos looked less special here, with Dragon Fly being iffy at times. The Dinamic Black dive into the crowd was big, but it doesn’t feel like he take over the match like he might. Maybe IWRG knew they were going to a big thing with Black Dragon by this point and played out the match that way. This is a fun TV match, and more in the ring trios than most of big match brawling IWRG. Total storytelling match, where Bandido comes to the ring with a bunch of belts and Flamita shows him what it means to be a real top guy. Bandido diving on Flamita to start the match only ticks him off more, and we’re treated to a rudo Flamita beating the life out of Bandido for a long period of time. Flamita asks the referee is Bandido wants to quit after a fierce dropkick, which is mostly about being a jerk but also an almost reasonable request. This story means it never goes the super fast pace you might expect out of both guys, though they do eventually get to the giant big spots trading. Bandido does enough to get make a good showing of himself before Flamita puts him away. Bandido doesn’t have quite enough to battle Flamita but this very much makes you want to see a rematch in a year or so when he might. Dragon Lee & Barbaro Cavernario had an obviously great match while also not even going at their maximum level. They’re both really good, and willing to do crazy things at ay time. Cavernario taking Dragon Lee’s tope and leaping backwards into the second row is a thing of legends. Dragon Lee being in an angry mood all match because Cavernario ambushed him gave the match a strong feeling, though it would’ve been even better if that could’ve played more into what Dragon Lee was trying. They went one move longer than I thought they would be going, and that’s a compliment because it sold how tough Cavernario is to beat. There’s a higher level match between them possible. This was still worth watching. The frame rate is pretty iffy on this one, which makes it pretty shaky to watch. It’s already pretty shaky to watch because it’s a Reyna Isis singles match. Sometimes you just need to know, you know. Isis submission at the end of the first fall looks good, which made it effective when they went back to it later. The rest of her offense is otherwise limited and not that interesting. There’s a front cracker near fall near the end that looks like a messed up monkey flip for a moment. Sugehit’s kicks need to be treated as bigger deals than they are here, that’s got to be something to separate her from everyone else. The finishing sequence was probably the best well done part of the match, going forward than expected and having some obvious thought put into it. It gives me a little hope they might figure out something more next time around. Sugehit kicks Isis so hard she hurts her own leg?? I haven’t seen a Ludark match all year so why not. She seems like a good opponent in theory for Keyra because she hits hard and is unafraid to hit hard back. Ludark takes a great bump off a Keyra headscissors and gets crushed by the dropkick into the corner. The action’s altogether strong in this one, the storytelling is not so great. Keyra takes most of the match, seemingly gets hit by just one Ludark big move, kicks out at one, and then frantically waves for crowd support as if she’s been getting beat for three minutes. Ludark really need to get more of this match to make it seem like Keyra accomplished anything. It’s still a worthwhile women’s match – the wrestling here is far ahead of Sugehit/Isis – and I hope Ludark pops up more in interesting places in 2018. This is the match where Zeuxis attacks Keyra to set up their own title match. Zeuxis’ outfit – hoodie and sweatpants – was not flattering. She would’ve been helped looking more like a star when making this run-in. It wouldn’t be an impressive moment unless you already knew them, and, as much as people reading this might follow CMLL, there’s plenty of indie lucha fans who don’t really pay it that much attention.